New article: Vito Mocella, Emmanuel Brun, Claudio Ferrero & Daniel Delattre, 'Revealing letters in rolled Herculaneum papyri by X-ray phase-contrast imaging' Nature Communications 6, Article number: 5895 doi:10.1038/ncomms6895 (20.1.2015). 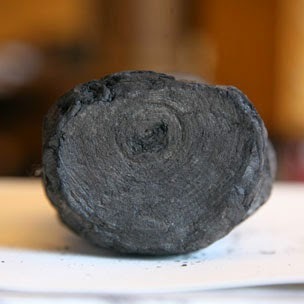 Hundreds of papyrus rolls, buried by the eruption of Mount Vesuvius in 79 AD and belonging to the only library passed on from Antiquity, were discovered 260 years ago at Herculaneum. 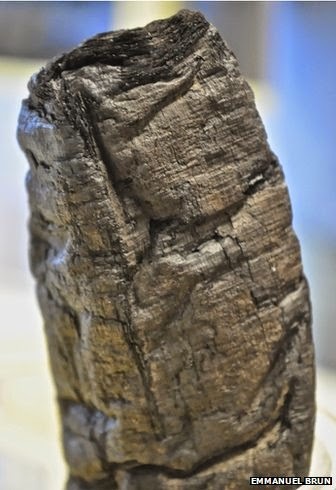 These carbonized papyri are extremely fragile and are inevitably damaged or destroyed in the process of trying to open them to read their contents. In recent years, new imaging techniques have been developed to read the texts without unwrapping the rolls. Until now, specialists have been unable to view the carbon-based ink of these papyri, even when they could penetrate the different layers of their spiral structure. Here for the first time, we show that X-ray phase-contrast tomography can reveal various letters hidden inside the precious papyri without unrolling them. 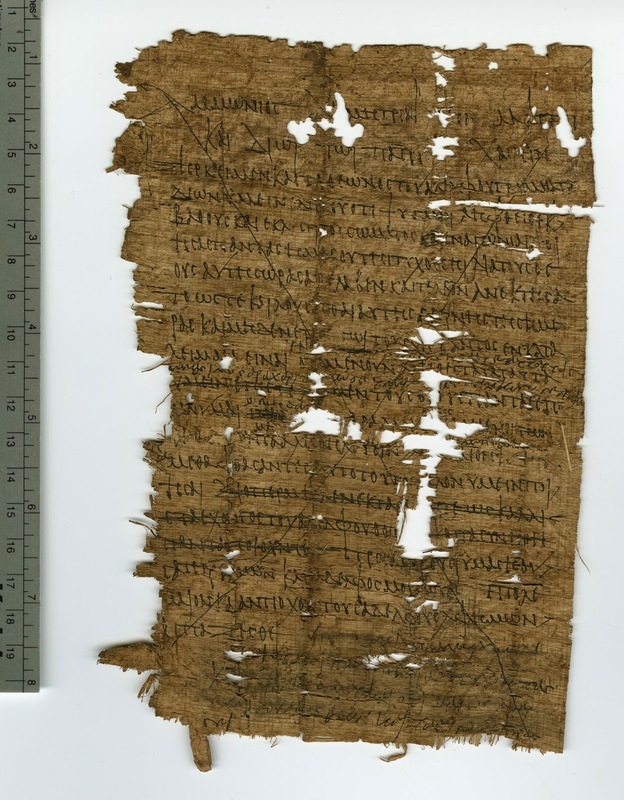 This attempt opens up new opportunities to read many Herculaneum papyri, which are still rolled up, thus enhancing our knowledge of ancient Greek literature and philosophy. 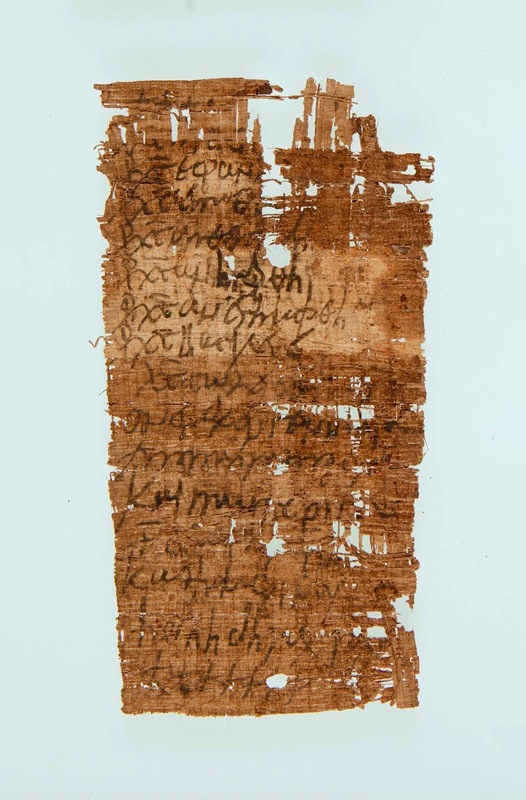 On the occasion of the eightieth anniversary of the official foundation of the ‘Leids Papyrologisch Instituut’, there is an excellent online the virtual papyrus exhibition ‘Texts from Ancient Egypt. Highlights from the Collection of the Leiden Papyrological Institute’. The provisional timetable is now available for the Ninth Birmingham Colloquium, to be held on 2nd-4th March 2015, and is included in this message below. We hope to welcome you to Birmingham in March. 2.45pm Carol Downer, "A consideration of some texts from de Lagarde's Coptic Catena"
7.00pm Colloquium dinner with address by Prof. Gordon Campbell. A few days ago the European Association of Biblical Studies committee accepted a proposal by Theodora Panella (ITSEE, Birmingham) for a workshop with the title “Textual Criticism of the NT, the OT and the Qur’an” for the next EABS’ Annual Meeting in Cordoba (July 12th-15th). Below is a description of the program unit and a call for papers. 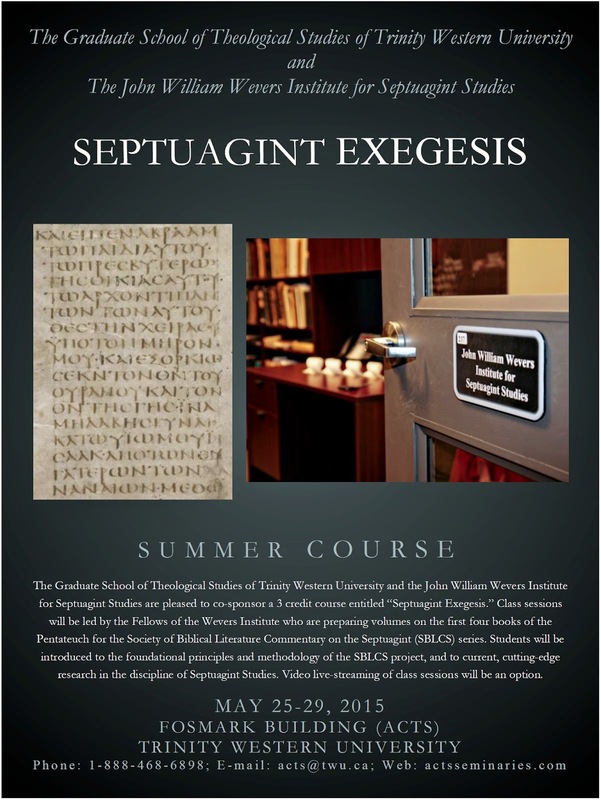 This workshop focuses on the textual study and criticism of sacred texts from the ancient Eastern Mediterranean world that later had a global influence. These are the Old Testament, the New Testament and the Qur’anic text. All three have similarities and differences. They have influenced other writings and at the same time have themselves undergone external influence bearing on questions of interrelationship, orality, textuality and language. Not only the abovementioned characteristics, but also their preservation and the copying as well as the proliferation of manuscripts are of particular interest to textual scholars. At the same time, this workshop seeks to foster dialogue among researchers. We welcome paper proposals that focus on the above mentioned topics and related aspects. Generally the duration of papers to be read should not exceed 20 minutes. Abstracts (no more than 300 words) have to be enrolled through the EABS meeting website. There is also a call for papers for the section on "Biblical Philology in Byzantine Manuscripts"
For more information, please contact Mariachiara Fincati (mc.fincati@gmail.com), Barbara Crostini (crostini.barbara@gmail.com) or the undersigned. Feel free to circulate this call. Here is another blog quiz (for earlier quizzes see: the conjectural emendation quiz, the geography quiz, a monastery quiz, a western text quiz, a NT majuscule manuscript quiz, a general manuscript quiz). This one is a little different, a little more difficult, some might even say down-right impossible. I'm not so sure (but I've got an answer key!). So, you have to identify the manuscript and the scribe. Some time ago, Peter Head blogged about a recent discovery of new fragments of the Gothic Bible. He referred to Carla Falluomini, who states in the new edition of The Text of the New Testament in Contemporary Research that: “no new parts of the Gothic Bible have been found that would have attracted attention to this branch of the biblical tradition” (p. 331). So this discovery, albeit of a fragment, is highly significant. In fact, it is significant as part of the few literary remains of the Gothic language in general. Professors Rosa Bianca Finazzi and Paola Tornaghi of The Università Cattolica del Sacro Cuore in Milan who made the fantastic discovery of the two folios dated to the 6th-century named it Gothica Bononiensia, since it was found in the Basilica of San Petronio in Bologna. They published a complete analysis including transcription of the text and images in “Gothica Bononiensia. Analisi linguistica e filologia di un nuovo documento,” Aevum 87 (2013): 113-155 (the image below is taken from this article, p. 152). Thanks to Irmengard Rauch from Berkeley University, an English translation is available in Interdisciplinary Journal for Germanic and Semiotic Analysis 19, 2 (2014): 1-56. Moreover, they have published another article focusing on the linguistic significance of the new finding: “Alcune riflessioni sul palinsesto gotico-latino di Bologna,” in Carla Falluomini ed., Intorno alle Saghe Norrene, Edizioni dell’Orso (Alessandria, 2014), 229-265. More on the Gothica Bononiensia here. 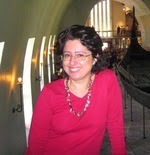 In the guestpost below, Carla Falluomini (University of Turin) offers further comments on the new fragment. She has specialized on the Gothic version and her new book The Gothic Version of the Gospels and Pauline Epistles is soon to be published in the ANTF series (ANTF 46) by De Gruyter. Carla was also a referee in the nomination process for the Gothic Codex Argenteus (the “Silver Bible”) to be included in the UNESCO’s Memory of the World Register (which happened in 2011). See my blogpost on that topic and the Gothic version in general here. The Gothic fragment discovered recently in Bologna (where it is preserved, in the Archivio della Fabbriceria della Basilica di San Petronio, Cart. 716/1, n°1; olim Cart. 353, cam. n°3) offers for the first time parts of an independent – i.e. non-translated – text, probably part of a sermon or liturgical prayer (there are markers of orality, which suggest that it was read in front of an audience). The main topic of the text is the power of God (the author offers some exempla of salvation, e.g. of the three Hebrews in the furnace, of Noah, etc. ). The manuscript may be dated in the first third/half of the sixth century, judging by the similarities with the other Gothic manuscripts. Some codicological divergences between this fragment and the Gothic manuscripts certainly produced in Ravenna suggest that the place of its production may be different. Verona, another important centre of Gothic power, might be a possible alternative. The script is the ‘sloping uncial’, a script used for glosses and texts of ‘everyday use’, not the elegant and regular script of the Codex Argenteus. 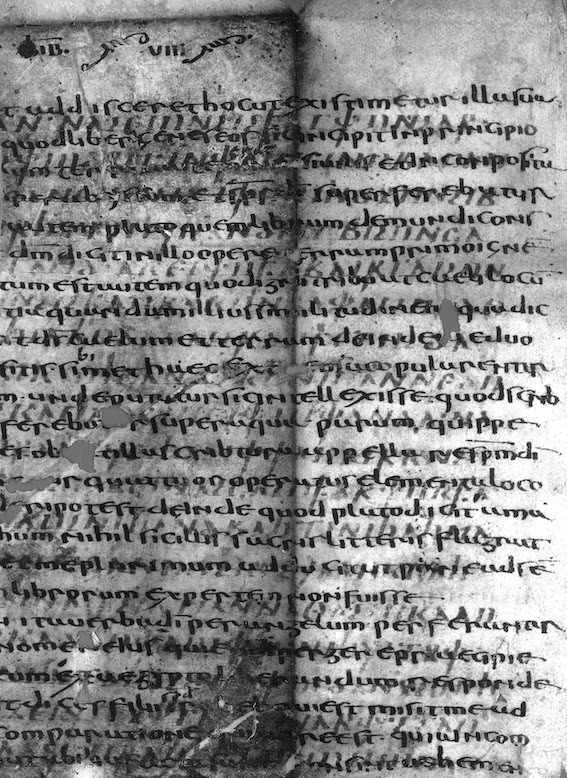 The place and period of the composition of the text is unknown but the most probable guess is that it was produced in North Italy, in the first part of the sixth century (it seems unlikely that this kind of text was brought from Moesia to Italy by Theoderic the Great and/or the Gothic clergy). The author is unknown (it is not impossible that the author coincides with the scribe). He was certainly a (Homean) priest, very expert in the Holy Scriptures. The text transmits several citations from the Old and New Testament, marked in the link margin by a horizontal sign (not a diplé as usual in the Gothic manuscripts). Some of these citations – e.g. from the Psalms, Acts and 1 Peter – are not preserved in the extant parts of the Gothic Bible, which is transmitted in a fragmentary form. The text of the citations derives from the Wulfilian tradition. It agrees perfectly with the text of the manuscripts of the Gothic Bible (only one deviation, which is not relevant to textual criticism). Furthermore, the author uses the particular form Nauel ‘Noah’, attested in the Gothic biblical tradition. Some Gothic words are attested for the first time, together with the title of the Acts (here in dative: tojam ‘deeds’). Update (2015-01-21): I have added a paragraph about the initial discovery of the new Gothic MS by Professors Rosa Bianca Finazzi and Paola Tornaghi (TW). A textual commentary on passages that differs between the Nestle-Aland Novum Testamentum Graece (28th ed.) and the Robinson-Pierpont The New Testament in the Original Greek: Byzantine Textform (2005) is in the making. The editors are Jonathan Borland and Mike Arcieri. According to Borland, "the commentary intends to supplement Metzger's by offering alternative views of the manuscript evidence held by various major editors of or commentators on the GNT over the last three centuries." Thus far passages in Matt 1-7 have been treated. Update: Maurice Robinson have explained that he is not contributing to the commentary so I removed his name. 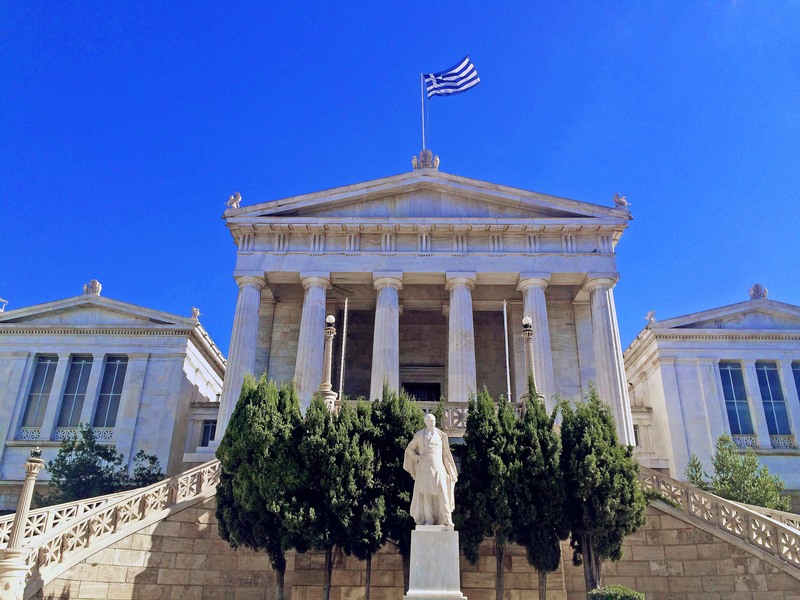 Breaking News: CSNTM to Digitize MSS at the National Library of Greece! Today the Center for the Study of New Testament Manuscripts (CSNTM) publically announced the breaking news that they are to digitize all the NT MSS of the National Library of Greece in Athens. Manuscript lovers world wide can be happy that more MSS are becoming available in digital format for study. The fact that this major project has been agreed upon by one of the largest repositories of Greek MSS in the world, the National Library of Greece, is a great acknowledgement of the CSNTM as a professional organization for manuscript photography and digitization. In addition, this undertaking may open up many more doors in the future. We owe our gratitude to Dan Wallace and his staff and we look forward to seeing the results. I am proud of being a member of the board of the CSNTM. Extra: Watch Dan Wallace breaking the news. Here is a part of the press release from CSNTM. On January 7, the Center for the Study of New Testament Manuscripts’ Executive Director, Dr. Daniel B. Wallace, and Research Manager, Robert D. Marcello, traveled to Athens to meet with the Director of the National Library, Filippos Tsimboglou. After meeting with the Director last September to begin discussions of a collaboration, they worked out final negotiations and signed a contract for CSNTM to digitize all the New Testament manuscripts of the National Library. This is a historic collaboration between one of the five largest repositories of Greek New Testament manuscripts and the world’s leading institute in digitizing Greek New Testament manuscripts. Approximately 300 manuscripts with 150,000+ pages of text will be digitized over the next two years. CSNTM is excited to be working with Dr. Tsimboglou and his staff on this strategic undertaking. Up-date report (Feb 20) here. 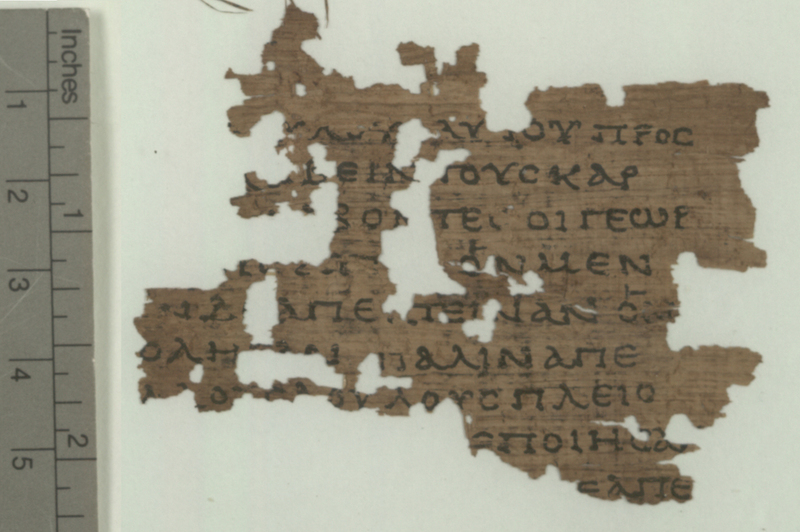 P. Oxy 4959 is a very interesting documentary letter of the second century - interesting at lots of levels in terms of content, style, grammar, compositional process (corrections and cross through), etc. (for info, text and ET see here) But it is also interesting because it shows some interesting word division, and even clearer marked spaces between sentences (cf. Dirk’s post from a couple of days ago), and uses filler marks at the end of lines (to keep a right hand justification - lines 4, 14, 17, 19) - not dissimilar in function at least to some NT literary texts (e.g. P66 and Sinaiticus). The 19th volume of TC: A Journal of Biblical Textual Criticism (2014) is now complete. A number of new articles have just been published on-line. The volume contains three full-length articles, two shorter articles ("notes"), one review article and plenty of book reviews. The editors welcome new submissions to the journal (see instructions here). Lincoln H. Blumell, Luke 22:43–44: An Anti-Docetic Interpolation or an Apologetic Omission? Abstract: This article examines the text-critical history of Luke 22:43–44 and argues, primarily on external grounds, that it is more likely that this passage was deliberately excised from Luke rather than interpolated. Along these lines it argues that this passage was excised from some early manuscripts of Luke prior to the end of the third century for apologetic reasons. Additionally, this article will question the anti-docetic interpolation theory, which is seemingly held by the majority of interpreters of this passage, and will argue that this is not the only way to understand the text-critical evidence. Abstract: In 1 John 2:7, the author of the epistle says that he is not writing the recipients a new command, but in the very next verse he seems to do an about face, now writing that the command is indeed new. According to most interpreters, this reversal can be attributed to the creativity of the author. This essay argues, in contrast, that the paradox is accidental, introduced through a primitive error in textual transmission. It proposes that 1 John 2:8 originally began πάλιν γράφω ὑμῖν (“Again I am writing to you”) and that ἐντολὴν καινήν (“new command”) was mistakenly imported into v. 8 early on in the letter’s textual history. By emending the text, we are able to resolve the grammatical and contextual anomalies of the present reading. Abstract: Habakkuk 3:4 and Deuteronomy 33:2 have long resisted straightforward interpretation. However, both verses apparently belong to the same tradition of southern theophany and both share a similar syntax and imagery. This short paper argues that both verses can be used to shed light on each other, and that the unusual syntax of the MT preserves an ancient idiomatic expression. Abstract: The name Mary was popular and a number of different women with this name are mentioned in the Gospel of John. The text of the Gospel of John in the Novum Testamentum Graece uses in this context the Hellenized and the transcribed form of the name “Mary” rather unsystematically. A scrutiny of the evidence as presented in the manuscripts points to a problem: cases where the transliterated form is used as accusative might be not so much a decision to use a transliterated form but a misspelled form of the Greek accusative—exchange of the nasals is a known phenomenon. That is, the distribution of forms of the name might in part be due to phonetics and incorrect spellings and not to a decision to use one of the two forms of the name. A possible conclusion might be that the Greek text of the Gospel of John should present only the Hellenized form and relegate the transcribed form to the apparatus (which in quite a few instances would accord with the fact that the Hellenized form may be better attested than the transcribed form). Abstract: What remains of this parchment codex suggests that it lacked Mark 15:28. Abstract: A review article on The Early Text of the New Testament (Charles E. Hill and Michael J. Kruger, eds). Winchester Cathedral is trying to recover illuminations stolen from the twelfth-century Winchester Bible. The British Library has published a list of the 1220 manuscripts with new digital images in A New Giant List. Meanwhile the British Library is now allowing personal digital photography of items in the collection (applauded by Roger Pearse). 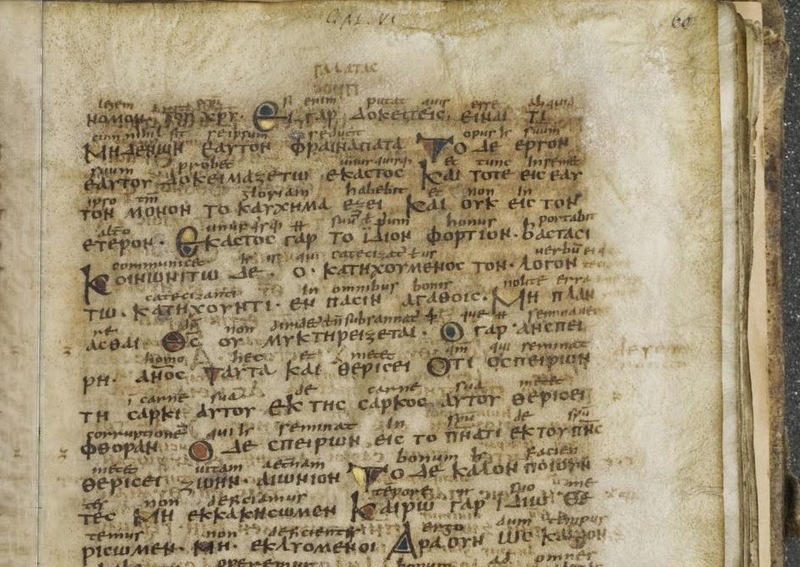 Duke University is returning a tenth-century Greek manuscript to Greece (not sure what it is a manuscript of, doesn’t look like a NT, but I could be wrong). Meanwhile some responses to the ill-informed on-line article about the Bible at “Newsweek” can be found from Mike Kruger (two parts, with comments from the author of the article); Ben Witherington; Darrell Bock (two parts); Pete Enns; Dan Wallace [up-dated here] (I’m not sure how this online “Newsweek” relates to the respected old print magazine, the ownership looks murky). The current Latin text of 0130 is a late one and is therefore, I guess, the later layer of a re-used manuscript. 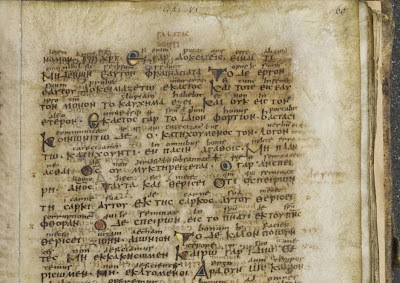 The Greek in the margin is then part of the original version. Based on the word division and the font that is identical to the two examples above, I would assume that this manuscripts comes from the same Greek - Latin stable. All ninth century, all Swiss. Parker (Bezae, 66) agrees and informs me that the Latin part of the original 0130 was 'quite certainly' never written. Why Latin script adopted word divisions and Greek did not till very late is still a mystery to me. "Misquoting Manuscripts? The Orthodox Corruption of Scripture Revisited"
Since I noted that someone had scanned an old essay of mine, “Misquoting Manuscripts? The Orthodox Corruption of Scripture Revisited“ which appeared in The Making of Christianity: Conflicts, Contacts, and Constructions: Essays in Honor of Bengt Holmberg (ed. M. Zetterholm and S. Byrskog; CBNTS 47; Eisenbrauns, 2012), and made it available on the internet without my permission, I thought I might just upload it to my own page on academia.edu. Space does not permit me to go through all of Ehrman’s examples of orthodox corruption in a systematic fashion. In the following I will therefore restrict myself to a selection of examples treated by Ehrman in one of the largest chapters of his monograph, those passages that, according to his claims, reflect anti-adoptionistic corruption. Nevertheless, I believe that the result of this survey, based on a relatively large number of passages is quite representative. I will demonstrate that Ehrman’s interpretation of the textual evidence in these passages is seriously defective. I should emphasize that my aim is not to prove that the New Testament textual tradition is unaffected by “orthodox corruption,” although I think this factor plays a minor role. Instead I attempt to prove that, on a closer inspection, many of Ehrman’s examples do not apply to the issue at all, and that often there are other, more plausibe explanations for the textual variation. The essay will soon appear on the resource page of this blog, which you should check out here.